Alright don't get excited, it's a clean story of a boy and a girl who went to Caerwent for the first time with their rally cars, nothing else. 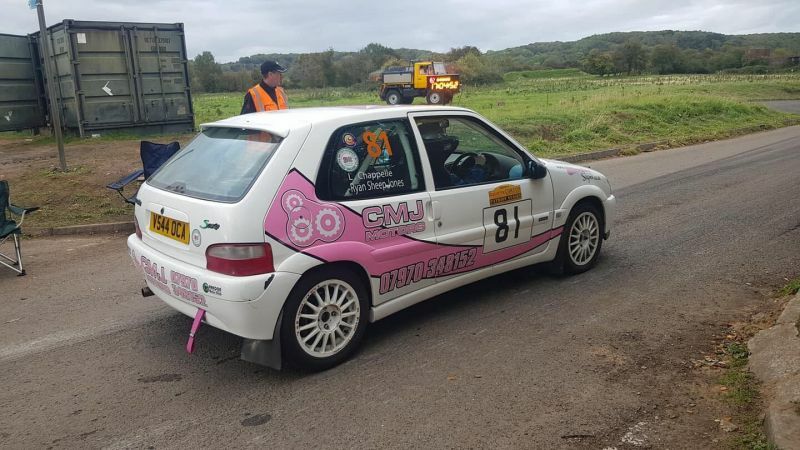 BMC members don't have a big history of competing at Caerwent but for the Patriot Stages Craig Jones and Lisa Chappelle both popped their cherries. Craig, accompanied by Ian Taylor was out to try the newly installed Drenth gearbox in the EVO9 and immediately posted his intent with a fifth fastest overall time. A few teething issues with the new 'box for the rest of the day saw a bit of movement up and down the leader board but sixth overall was the fine final result. Lisa Chappelle wheeled out the familiar white and pink Saxo and also had a new co-driver in Ryan 'Sheep' Jones who kept things on the boil. Passing two cars on stage one boosted confidence for the day and 48th was the result with a good few cars in their wake.